Yesterday, I preached my first full sermon on the theme of God’s sovereignty. I talked about how God is in control of our world, and then I talked about what it means for our lives. One thing it means, I said, is that we are no longer allowed to worry. I realize that for some of us, that’s like saying, “You’re no longer allowed to breathe”—because worry is so integral to our lives. I promise, I almost want someone to abduct me so I can see if these suggestions really work! But I’ll probably never be held captive with zip ties. I’ll likely never fall through the ice while ice-fishing. I’ll probably never get stuck in quicksand. And it just goes to show that the vast majority of things we worry about don’t come to pass. The worst case scenario won’t happen. And all we’ve done is worry needlessly. Or… say the worst-case scenario does happen, and we truly have something to worry about, then—because of all that advance worrying—we’ll have just worried twice as much as we needed to! So, if you have to worry, just worry when it actually happens! Better yet, let’s not worry at all. 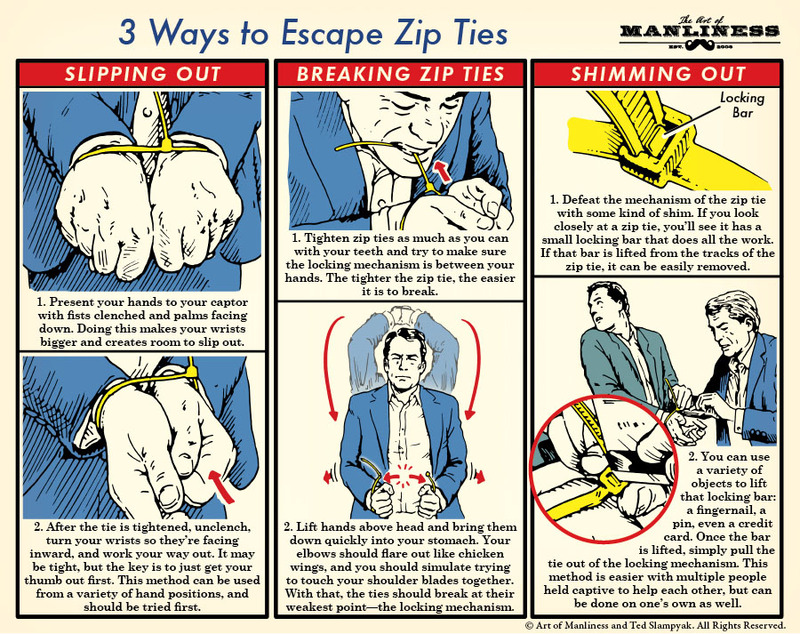 Anyway, I need to share this graphic here—in part because I could tell that my congregation was unusually interested in learning how to escape from being bound with zip ties! This entry was posted on	April 28, 2014 at 9:16 am	and is filed under Uncategorized.